The 25-member Local Government Affairs Council (LGAC) is appointed by the Chamber Board of Directors. LGAC meets on a weekly basis to review and take action on public policy issues that impact the local economy. Members are welcome to attend. Vacancies are announced in Chamber publications. Membership Council is a comprised of volunteer Chamber member professionals working with Chamber staff to provide outreach to the general membership. The group gathers monthly to collect and share newsworthy information about our members, welcome new members, and thank members for their partnership. Outreach includes visits to new members’ places of business and phone calls each month to express appreciation, as well as collect changes in information. Chamber Councilors must apply for a position with the Director, Jen McGreaham. The Eugene Chamber Ambassadors are the goodwill council of the Eugene Chamber. The Ambassadors are selected volunteers charged with assisting Chamber staff at certain networking events with light duties, and celebrating Chamber members’ grand openings, ribbon cuttings, and other celebrations. This group of professionals are involved Chamber members capable of directing and welcoming new members to the Chamber community. 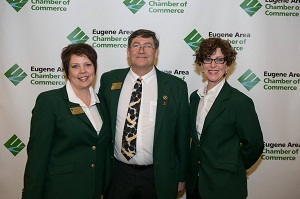 The Eugene Chamber Ambassadors wear a uniform including a custom green jacket and name tag, with a tie for men, black slacks or skirt, and a white shirt. Interested individuals may inquire with the 2016 Ambassador Chairs, Dwight Dzierzek and Tiffany Sousa.